Francis J.Parker, Frank J. Parker, Frankie G. Parker. Automobile thief, distillery owner, brewery owner, known as the flying bootlegger. Born in Oil City, PA . He worked the oil fields there and left school at the age of 15. He later moved to Detroit and worked as an ignition expert during the war.Parker lived in Montreal, Canada from 1925-1931, owning many distilleries there. He claimed during his trial that he owned a mine in Colorado and two breweries in Chicago.The Bismark and Roosevelt. April 4,1913 - Fined $15 and sentenced to 10 days imprisonment.Charge unrecorded. October 3,1914 - Sentenced to 5 to 25 years at Joliet penitentiary for burglary. October 16,1915 - Paroled on technicality in mittimus. March 13,1917- Returned to prison for violation of parole (Stealing automobiles). September 20,1920 - Discharged from parole. Parker was indicted in 1926 by a federal grand jury as the owner of Archer products brewery which was raided on July 49,1926. 5,000 Gallons of beer and a $100,000 of distillery equipment was seized.Parker was not apprehended and the conspiracy charges against him were dropped the next year. Frank J Parker , Aviator millionaire who had humble beginnings as once committing a crime against nature which was stricken off the record .God only knows what the crime was.Parker started his life of crime as a petty hoodlum.He was known to Chicago police as the leader of an auto theft ring which stole more than a 1,000 cars. Parker was also named in the Gov. Len Small pardon scandal in which crinminals were given easy pardons.Parker had been given one of those famous pardons. Not all bad ,Parker once courageously flew food and clothing to fishermen stranded by a blizzard on South Fox island in March of 1926. Parker lead a double life, also dabbling on the other side of the border, owning distilleries in Montreal ,Canada. In fact he owned several of them of which made him much sought after by bootlegging gangs in Chicago and Detroit. Parker had friends on both sides of Chicago supplying them with products like Mumm's champagne,Old Log Cabin whiskey, Old Colonel, Old Tom gin, Mountain Ridge whiskey and other assortment of liquors. Since Parker was also an accomplished flyer, he would transport the hooch unmolested into Chicago or Detroit. Parker supplied and delivered making him rich in the process. Parker had old ties to the Northsiders supplying them with the best in Canadian booze. Hymie Weiss was said to have met his girlfriend in Montreal while doing business with Parker there. 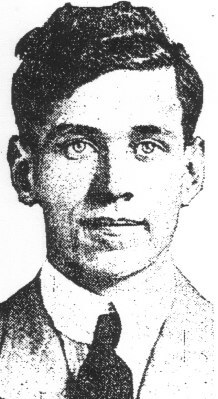 Parker dealt with Ted Newberry as bank tranactions uncovered by authorities showed even after Newberry defected to the Capone camp. In 1930, Canadian authorities put their hands on Parker and figured that the Montreal distillery owner was also a criminal who had done time in Joliet prison. Parker was facing perjury charges in Montreal for bribing two excise officers while running the Dominion distillery and dealing in shady affairs. (Evading taxes). Parker was freed on a $10,000 bond in the Canadian case. Parker's life of crime does not end there. He is also arrested in a forgery case (American Express cheques) with his known pals Bugs Moran and others. After the first trial in which they are found not guilty they are later retried. On May 20th,1933, Parker is shot at and wounded as he is making his way to his home at 1614 Jonquil terrace. Parker tells police that he was shot by one of three bandits while resisting the holdup. In another case Frank Parker is trapped through intercepted letters explaining where a cache of counterfeit bills are located.They are found by government agents at the Tam O' Shanter, a golf course in Niles. April 14th 1939 Frank Parker is found guilty of counterfeiting. April 22,1939 Frank J. Parker is sentenced to two years in prison and fined $10,000 on counterfeiting charges. January 1941 Frank Parker seeks pardon for his crimes but the judge refuses and orders him to do his remaining year in the Cook county jail.